Sarpang and Trashigang have the highest number of top performing schools in 2018. Seven schools in Sarpang district topped in classes three and six while Trashigang has the highest number of top-ranked schools in classes 10 and 12. This is as per education ministry’s annual school rankings of 2018 released earlier this month. Annual rankings of top ten schools are declared at four levels of schools. Ugyen Academy Higher Secondary School repeats as the top performer in 2018’s class 12 while Radhi Middle Secondary School topped in class 10. None of the government schools in Thimphu made it to the top ten. Karma Academy in Paro is the only private school to make it to top ten in class twelve besides Ugyen Academy. 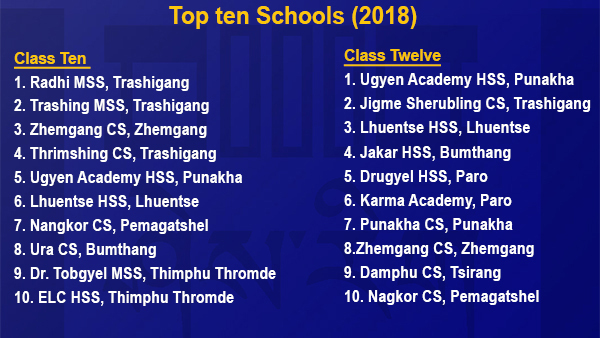 In addition, four private schools that include Dr Tobgyel Middle Secondary School, ELC Higher Secondary School and Thimphu Primary School in Thimphu and Utpal Junior Wing in Paro made it top ten in classes ten and six respectively. The performances of the schools are based on three categories of academic learning, enabling practices and GNH. Academic learning measures school’s performance against student academic outcomes such as percentage of student performing above 45, 60 and 70 per cent. It also stresses on authentic learning rather than rote learning. Enabling practices measure the effectiveness of critical processes and practices of school management, quality and impact of teaching and training, infrastructure and effectiveness of school planning processes. This category is assessed by District Education Officers (DEO) at the start and towards the end of every academic year. And GNH measures achievement on GNH values and practices in schools as measured through GNH indicators developed by Education Monitoring Division. This is also assessed by DEOs twice every year. While top performing schools are recognized with certificates, the rankings also identify schools needing improvement. Education Monitoring Officers visit schools with an objective to find out the causes of low performance and identify appropriate interventions.